Above: Pick a cave adventure at El Malpais National Monument. 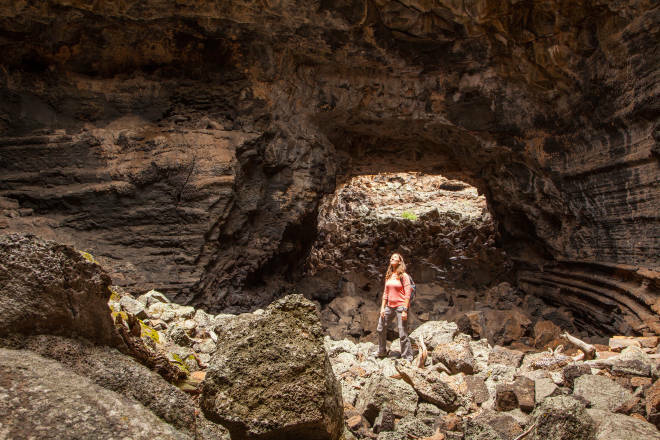 This easy, 2.2-mile trail loops through an extensive system of lava-tube caves in El Malpais National Monument. Tack on extra distance (and difficulty) by entering the caves—for which you need to get a free permit in nearby Grants (505-876-2783, nps.gov/elma). THE TRAILHEAD: From Grants, take NM 53 south about 27 miles to CR 42. Follow that dirt road about 6.5 miles to Big Tubes Road, which turns left (east). A high-clearance vehicle is helpful for the next 3.8 miles to the parking area. Be sure that your tires are in good condition and that you have a spare; the area is remote. Do not attempt after a heavy rain. Only cairns mark the trail’s route. Recommended: a compass, topo map, and/or GPS unit. To explore the caves, wear a hard hat, long pants, and gloves, and bring three good sources of light. WHAT YOU’LL SEE: Look for rock cairns heading east. Follow them onto a rolling sea of 10,000-year-old lava with ponderosa pine, alligator juniper, and piñon pine. Just before you get to the tube at Big Skylight Cave, the cairns split in two directions, marking the start of the loop. The lava-tube system is more than 17 miles long, including collapsed sections and deep pits. At Big Skylight and Four Windows, you can find easy places to scramble down. The floors are commonly boulder piles of loose, shifting rock. Be careful! On the trail, go right at the first junction, by Big Skylight Cave, to Seven Bridges, where much of the tube collapsed. The route curves back north and comes to another junction at Four Windows Cave. Go right and continue north to Caterpillar Collapse. The trail arcs around it and heads southwest to the start of the loop. A shortcut between Big Skylight and Four Windows has a spur to the north that leads to Giant Ice Cave, if you haven’t had your fill.